Our range of products include temperature controller and dual loop output control. We offer Temperature Controller DTA Series Standard Model to our clients, which has an in-built RS485 communication system and supports Modbus ASCII and RTU protocol. It includes thermocouple and RTD as a input sensor. Further, 2 alarm outputs are available with 10 various alarm modes. 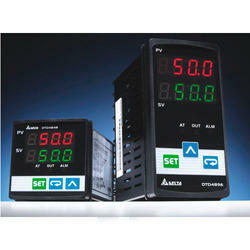 It has various control modes like ON/OFF, Manual control and Support PID. We have, DTB Series Dual Loop Output Control, in our store for our customers, which has thermocouple, RTD, Voltage and Current as a temperature input sensor. It has support PID Auto-tuning function and Valve control. It has various control modes including , ON/OFF, Ramp/Soak Program and Manual control. Looking for Temperature Controllers ?